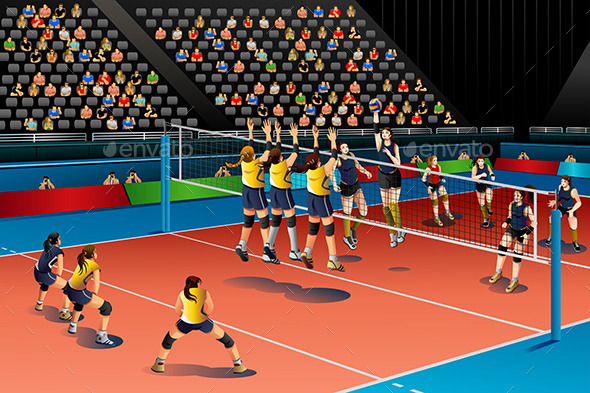 A vector illustration of people playing volleyball in the competition for sport competition series. Vector illustration, zip archive contain eps 10 and high resolution jpeg. Keywords: adult, athlete, audience, cartoon, clip-art, clipart, competition, defense, exercise, female, fitness, health, illustration, jumping, leisure, lifestyle, modern, people, players, playing, sport, stadium, team, teamwork, tournament, vector, volley, volleyball, woman, young.